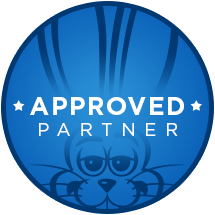 We are requesting that you add the “approved partner” badge to your website to show your studio is using our official software. Our goal is to contribute to helping visitors/customers on your site see that you are up to date with technology and offering the newest features for their convenience. There are two ways to to get this done. Method 1. Right click the badge above and “Save Image As”. Save the image to the desktop. Upload it to your site’s server. Place it somewhere on your site and link it back to the Jackrabbit Class. Feel free to resize it! Method 2. Copy and paste the code below to embed it anywhere on your website and the badge will be live! Again, feel free to change the height & width. Can I resize the badge? Where should I place the badge? Wherever you think it looks best! We recommend somewhere at the bottom of the site in the footer. If you have any questions or are unsure how to make this happen, please email onlinereg@jackrabbittech.com.